Following a secret ballot, MPs in the Catalan parliament declared independence from Spain, with the regional leader Carlos Puigdemont saying the people had completed “a long-desired step.” Lawmakers opposed to independence boycotted the vote. The assembly’s speaker announced that the motion was passed with 70 votes in favor, 10 against, and two blank ballots, according to Reuters. Earlier, MP’s from the three main national parties – the People's Party, the Socialists and Ciudadanos – staged a walkout in protest at the vote. “In the days ahead we must keep to our values of pacifism and dignity. It's in our, in your hands to build the republic," Catalan President Carles Puigdemont told a crowd of hundreds of supporters at Catalonia's parliament building following the vote. He added that "today the parliament fulfilled the long-desired and fought-for step, and culminated the mandate of the ballot boxes," referencing the October 1 independence referendum. 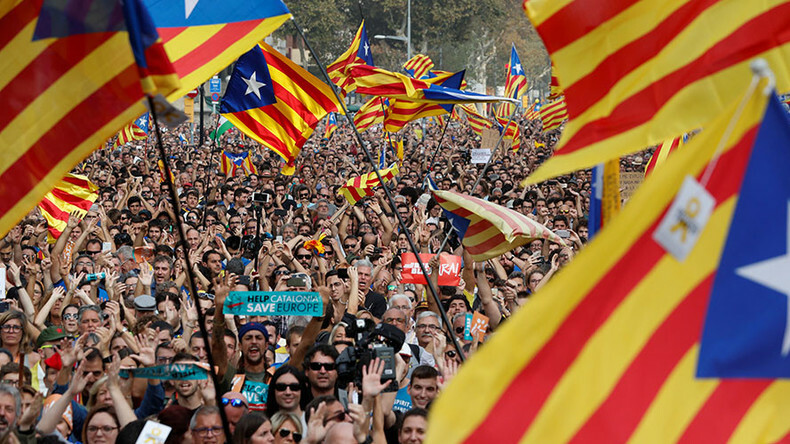 Puigdemont's remarks prompted supporters to erupt into the Catalan anthem 'Els Segadors' (The Reapers) and chants of "Liberty!" Shortly after the Catalan vote, the upper house of Spain's parliament approved direct rule by Madrid. "Spain is a serious country and a great nation and we will not tolerate that a few people try liquidate our constitution," he told journalists after the upper house approved the imposition of direct rule for Catalonia. Meanwhile, Rajoy has urged for calm, stating that the rule of law will be restored in Catalonia. “I ask for calm from all Spaniards. 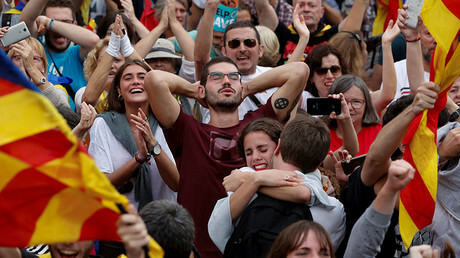 The rule of law will restore legality in Catalonia,” he tweeted. European Council President Donald Tusk has urged both sides to opt for dialogue rather than violence, adding that Brussels will continue to only speak to Spain's central government. "For EU nothing changes. Spain remains our only interlocutor," Tusk wrote on Twitter. In response, Puigdemont tweeted: "As you know, Catalans always favor the force of arguments," using the hashtags #peace #democracy and #dialogue. It comes just one day after Catalan President Carles Puigdemont announced that he would not be calling a snap election for the region, contrary to rumors that had suggested otherwise. “I was ready to call an election if guarantees were given. There is no guarantee that justifies calling an election today,” Puigdemont said. It was now up to the Catalan parliament to move forward with a mandate to split form Spain following the region’s independence referendum on October 1, he added. Madrid, however, has deemed the referendum illegal and void. Following the plebiscite, Spanish police launched a crackdown that resulted in hundreds of people being injured across the region, according to Catalonia's health department. Shortly afterwards, the human rights commissioner of the Council of Europe contacted Spain's interior minister seeking "swift, independent and effective" investigations into allegations of disproportionate use of force by police officers. Human Rights Watch also criticized the actions of Madrid, saying they had used "excessive force towards peaceful Catalans expressing their political opinion."